The Aswat Ensemble and ICCNC invites you to a concert celebrating the beautiful and strong cultural heritage of Sudan and Nubia. We are very excited to, once again, welcome powerhouse Sudanese vocalist Salma El-Assal for this program and special guests Aswat Youth Ensemble and the Sudanese Association of Northern California Youth Choir! General tickets are $10/person and can be purchased at https://ProudToBeAfrican.bpt.me. Please join us for the biweekly discussion of the first book of Masnavi in Farsi by Dr. Abdulkarim Soroush. The new meeting location is at Campbell Community Center located at 1 W Campbell, Room Q-84 Mary Campbell, Campbell, CA. Pleas join us for recitation of Quran, Dua Kumayl, congragational prayers, and the first community iftar of this year’s Ramadan at ICCNC. Program starts at 7:30 PM with Quran, followed by Dua Kumayl, prayers, and iftar. The Iftar is potluck so bring the best examples of your home cooking to share with the community. All meal must be Halal or vegetarian. Pleas join us for recitation of Quran, Dua Kumayl, congregational prayers, and the first community iftar of this year’s Ramadan at ICCNC. On Saturday, May 18, 2019, at 7:00 PM ICCNC will host its annual Ramadan Open House and Iftar sharing event. The purpose of the event is to bring the greater community and neighbors together to break bread and share in a conversation about Islam and Muslims in the spirit of friendship, compassion, and generosity. The Open House offers the opportunity for guests to attend an engaging interactive talk, socialize with their Muslim neighbors, and share in a traditional fast-breaking dinner known as iftar. Program: Quranic recitation and translation, speech by Dr. Hamid Mavani, question and answers session, congregational sunset (Maghreb) prayer, and Iftar. Please RSVP by Thursday May 16th. Please join us for the special Laylatul Qadr Program on Thursday May 23, 2019 starting at 8:30 PM. May 23, 2019 is the 18th of Ramadan 1400 AH. The night of 18th of Ramadan is significant for Shia Muslims becuaue Imam Ali ibn Abi Talib (AS), was asassinated on the morning of Ramadan 19, 40 AH during his morning prayer by a Kharijite called Ibn Muljam, at the Great Mosque of Kufah in Iraq. Imam Ali (AS) died two days later due to his injuries on Ramadan 21, 40 AH (January 28, 661 CE). Imam Ali (AS) was the cousin and son-in-law of the Prophet Muhammad (PBUH). Please join us for the special Laylatul Qadr Program and Martyrdom of Imam Ali (AS) on Saturday, May 25, 2019 starting at 8:30 PM (Ramadan 20, 1400 AH). The night of Ramadan 20th is significant to Shia Muslims because Imam Ali ibn Abi Talib (AS) died on Ramadan 21, 40 AH (January 28, 661 CE) due to the injuries he sustained in his assassination by Ibn Muljam two days earlier during his morning paryer at the Great Mosque of Kufah in Iraq. Imam Ali (AS) was the cousin and son-in-law of the Prophet Muhammad (PBUH). Please join us for the special Laylatul Qadr Program on Sunday May 27, 2019 starting at 8:30 PM. May 27, 2019 is the 22nd of Ramadan 1400 AH. The program includes: congregational prayers, Iftar, short Farsi lecture by Mr. Mostafa Daneshgar, special Laytul Qadr ceremony (Ahaya) and Azadari. Please join the biweekly lectures in Farsi by by Dr. Abdolkarim Soroush on the important topic of religion and power. Meetings are held at Campbell Community Center, 1 W Campbell, Room Q-84 Mary Campbell, Campbell, CA 95008. Please join us on Saturday April 20, 2019, starting at 5;30 PM for the celebration of 15th of Shaban - Birthday of Imam Mahdi (AS).. Program: Quranic recitation, English lecture by Dr. Seyyed Hossein Nasr via prerecorded video conference, “Messianism and Millennialism in the Ibrahamic Religions particularly Islam”, games and competition, special program for children, prayers, and dinner. Dr. Seyyed Hossein Nasr graduated from Massachusetts Institute of Technology with an undergraduate degree in Physics and Mathematics. He went on to Harvard University where he studied Geology and Geophysics, and then completed a PhD in the History of Science and Philosophy. He is a world renown scholar on Islam and is currently a University Professor at GW. He has published over fifty books and hundreds of articles in numerous languages and translations. We are pleased to announce a series of lectures by Mr. Abdolali Bazargan at ICCNC, occurring on the second Saturday of every other month from 6 to 8pm. The central theme of Mr. Bazargan’s lectures is focused on the ethical dimensions emphasized in the Qur’an and traditions (or hadith) of the Prophet Muhammad (pbuh) and the Twelve Imams. Mr. Bazargan addresses the history and processes of scriptural interpretation that have often given rise to dubious understandings of the text. He argues that the commitment to equality, liberalism, and pluralism resonates with the spirit of early Islam, when an emerging theology was intrinsically wedded to one of liberty. Mr. Abdolali Bazargan was born in 1943 in Tehran, Iran. He is the second child of the late Mohandas Mehdi Bazargan, the first Prime Minister of Iran after the Islamic Revolution. He has a Masters in Architecture Design from Shahid Beheshti (Melli) University, Tehran, Iran and has more than 45 years of experience in designing buildings. Mr. Bazargan has spent much of his life devoted to the study and teachings of Quran. He has over 20 publications in social and religious subjects, including Qur’anic research and Islamic teachings. Unfortunately, this event is cancelled. Hope you can join us for the next lecture on May 4, 2019. Please join us for monthly Farsi lecture series by Dr. Abdolkarim Soroush on the interpretation of Al-Ghazali's "The Alchemy of Happiness" "کیمیای سعادت غزالی"
A Celebration of Imam Ali's (AS) Birthday and After Eid Nowruz Community Gathering "Eid-Didani"
An event for families and friends to come together in a friendly and relaxing setting to celebrate the birth of Imam Ali (AS) and see each other in the new Persian New Year. Program: Eid Didani, Quranic Recitation, Farsi Lecture by Dr. Akhlaq: امام علی‌، سنت نوروز، و دوستی‌ انسان و طبیعت , Mawludi, Best Cake Competition, Games, Children's' Program, Prayer, and Dinner. To participate in the Best Cake Competition please register by sending your name and email to info@iccnc.org. Dr. Sayed Hassan Hussaini, "Akhlaq," specializes in philosophy and religion. He is involved in comparative study, dialogue among civilizations, and inter and intra-faith dialogue. For the past decade he wrote books, papers, and gave lectures and speeches worldwide, including in the U.S., United Arab Emirates, Iran, Afghanistan, South Korea, Greece, Russia, and the United Kingdom. In addition, he gives scholarly lectures for religious communities. He earned a Ph.D. in philosophy from Allameh Tabatabaii University in Tehran, Iran. He completed his Islamic theological studies (Hawzeh Elmieh) in Mashhad. He worked as the chancellor of Gharjistan University, branch of Farah-Afghanistan in 2011; he acted as an academic advisor of Afghanistan Academy of Sciences in 2010; he has taught in Iranian universities, including Al-Mustafa International University and Payam-e Noor. He published four books (in Iran and Afghanistan), written in Farsi. His last work “The Secular and the Sacred: Complementary and/or Conflictual?” was co-edited by John Hogan and published by the Council for Research in Values & Philosophy (2017). Akhlaq was a Visiting Scholar at both Catholic University of America (2012-2017) and George Washington University (2013-2016). He was at Boston University for the 2017-18 academic year. He is currently teaching at Northern Virginia College. A new lecture series in Farsi by Dr. Abdulkarim Soroush. Starting on Saturday, Feb. 9, 2019. If you like to participate in this meaningful conversation, please RSVP with Dr. Payman Amiri at payman.amiri@iccnc.org by February 24, 2019. ICCNC will be working with the local Christian and Jewish congregations to combat hunger in Oakland by sorting and bagging food at Alameda County Community Food Bank (ACCFB) in Oakland on Friday Feb. 22, 2019 from 8:30 to 11:30 a.m. Please be there by 8:20 a.m. to register and get to know the other volunteers. If you can join us to work at ACCFB, please RSVP with Ali Sheikholeslami at ali.sheikholeslami@iccnc.org by Sunday Feb. 17, 2019. Location: ACCFB 7900 Edgewater Dr., Oakland, CA 94612, (510) 635-3663. Please wear comfortable warm clothes and closed-toe shoes. To get an idea of what this volunteer activity is like, see photos here from two years ago https://www.smugmug.com/gallery/n-TDSgbW/. The legendary poet Amir Sulaiman will be performing on February 9th in Pleasanton, California. He will be joined by the talented Ahlaam Abduljalil, Abbas Mohamed and Nile Mystic, who represent a new generation of spoken word artists. Join us for Hub Talks on intersections between art, spirituality, love and justice. Come celebrate a group of powerful artists who speak truth from the heart. This event will also have an exhibition of visual art from GAMA artists and is cosponsored by Hub Foundation, Ta’leef Collective and GAMA. Dinner will be served at 6:30pm. Program: Quranic recitation, poetry reading, lecture by Mr. Abdolali Bazargan (in Farsi) کوثر و تکاثر followed by light dinner. Every other Sunday starting on Jan. 13, 2019 starting at 6 p.m. 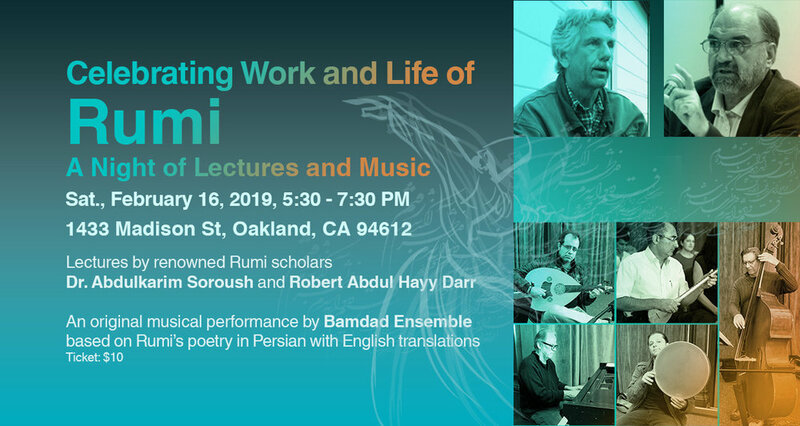 The program for this concert focuses on a body of Turkish Sufi sacred music called Shughul which has its roots in the Arab world, mostly from Aleppo and Baghdad. This body of music, researched heavily by the director, has been harvested from the remains of an ancient treasure trove. It comes to us through three fragmented sources amateur recordings made in the 1960s and 1970s, manuscripts containing the lyrics of hundreds of songs, and sheet music written down in the 1940s and 1950s by researchers, providing notation of the songs last performed in this rich tradition. A Living Room Conversation is planned for congregants from Kehilla, the Montclair Presbyterian Church, and ICCNC. We will meet in small groups of 5 and have the opportunity to respond to questions about ourselves. It is a wonderful opportunity to listen to each others’ perspectives and feeling about each of our faiths. To learn more about Living Room Conversations please look at the website https://www.livingroomconversations.org. Please RSVP to Steven Falk at shfalk@gmail.com or (510) 708-0517 by January 15. If you can join us to work at ACCFB, please sign up with Ali Sheikholeslami by Friday Dec. 21, 2018. To get an idea of what this volunteer activity is like, see photos here from two years ago https://www.smugmug.com/gallery/n-TDSgbW/. This is a popular activity, so sign up soon. We are pleased to announce a series of lectures by Mr. Abdolali Bazargan at ICCNC, occurring the second Saturday of every other month from 6-8pm. *Light dinner will be served. The central theme of Abdolali Bazargan’s lectures is focused on the ethical dimensions emphasized in the Qur’an and traditions (or hadith) of the Prophet Muhammad and the Twelve Imams. Mr. Bazargan addresses the history and processes of scriptural interpretation that have often given rise to dubious understandings of the text. He argues that the commitment to equality, liberalism, and pluralism resonates with the spirit of early Islam, when an emerging theology was intrinsically wedded to one of liberty. Mr. Abdolali Bazargan was born in 1943 in Tehran, Iran. He is the second child of the late Mohandas Mehdi Bazargan, the first Prime Minister of Iran after the Islamic Revolution. He has a Masters in Architecture Design from Shahid Beheshti (Melli) University, Tehran, Iran and has more than 45 years of experience in designing buildings. Mr. Bazargan has spent much of his life devoted to the study and teachings of Quran. He has over 20 publications in social and religious subjects, including Qur’anicresearch and Islamic teachings.